Since our Hong Kong trip last November, at which time I bought some metallic Disneyland character bookmarks and an entire bunch for some friends back home, I thought of having a new features post on the blog devoted to them: bookmarks! Bookmarks from abroad, bookmarks I bought or gifts from friends, handmade bookmarks, metallic bookmarks, magnetic bookmarks, any and all kinds of bookmarks. I figured that since I've been hoarding collecting them anyway, why not make a special feature about them, too? First for this feature: the Hong Kong bookmarks I purchased last year. 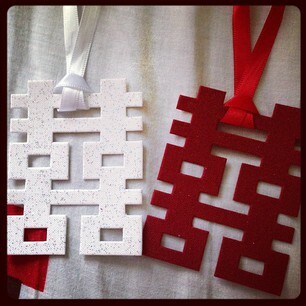 These are Chinese characters which mean "double happiness." A few hours before our return flight, I was scouring the Page One branch at Harbour City Mall for bookmarks. You know, old-fashioned cardboard or paper, Hong Kong-ish bookmarks. Page One disappointed me! They only had those small magnetic bookmarks with animated things and such on them. Boo. That's what I do too. Instead of refrigerator magnets, I collect bookmarks from places I've been to. where's my bookmark from HK? :( demanding lol! i like this feature, Monique!